Weeding, or as some prefer to call it, de-accessioning or de-selecting, is a critical function for the health and maintenance of a library collection. Books that are old, outdated, or simply in poor condition can take up valuable shelf space and reflect poorly on the collection as a whole. It is important to review all the books in a collection every few years to make sure they still reflect and uphold the library’s scope and mission. What does this book add to our collection? Will patrons actually use this book? Does this book fit one of the subject areas the library represents? Many librarians are more reluctant to weed for fear that someone, someday, will need a particular book, and will be devastated to find that it was removed from the collection. It is particularly challenging to judge the relevance of a book in a Smithsonian library collection, which supports such a broad range of research needs. In the weeks I spent going through the Z’s, wrapped in a shawl and covered in dust, I witnessed the evolution of library practices over time. 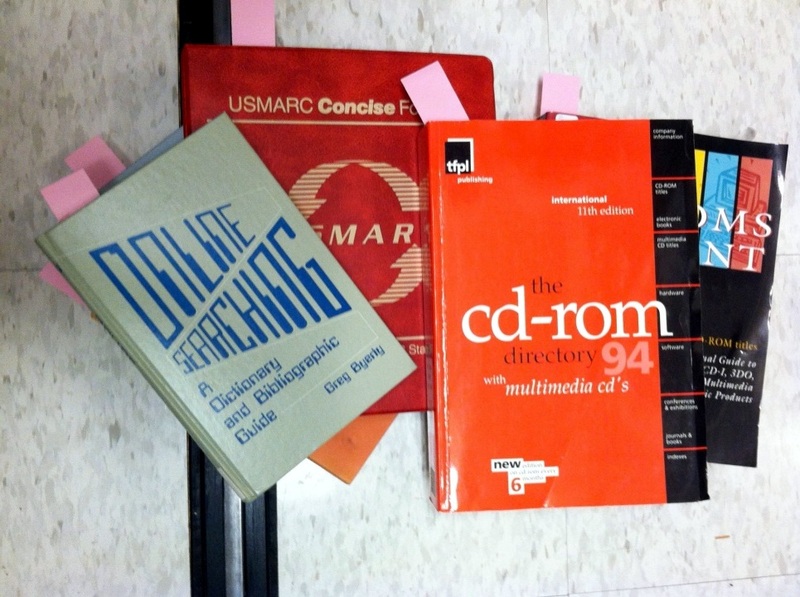 I found early manuals about conducting online searches, obsolete MARC guidelines, and CD-ROM directories. I also got a glimpse into the Smithsonian Institution’s history by looking through its annual reports dating as far back as the mid-1800s. A question emerged out of the cloud of dust: when are old materials actually “historical” and not simply outdated? A physical catalog from a fine arts library could offer valuable insight into its past collections, but a manual for how to maintain microform collections is useless. Some materials serve as historical posterity with research value, while others simply take up space. The line between history and nostalgia is one that shifts on a yearly basis, and so it is necessary to revisit that line from different perspectives over time. -Post contributed by AA/PG Library intern Becca Tanen. I enjoyed this. I work at a university and my office happens to be in one of our libraries (though I don’t work for the libraries). 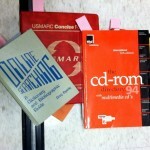 Right outside my office are stacks and stacks of technical and mathematical books that I’ve never seen anyone look for. Nonetheless, I enjoy picking off a random book and poking through it for a minute, if for no other reason than to see what has been important enough to be put in our collection. I don’t understand any of it, but I love that it’s here for those who do. p.s. I feel like somewhere, there must be a person who’d be interested in a manual about microfilming. Stranger things have been sold on eBay!